So you just jumped off the plane on your dream birding trip to Ecuador. You bought the book and you’ve been studying it and think you have a handle on the 1660 species listed. Or maybe you’re just on your first trip to the Texas Coast for Spring Migration. A small yellow bird darts by. All your study flies right out the window. Where to start the search? Was it a finch? A warbler? Something else you’re not considering? The BirdsEye Smart Search can help. You can access the smart search from either the home screen or the from the nearby species screen. Touch the magnifying glass next to the search bar on the Nearby Species screen. 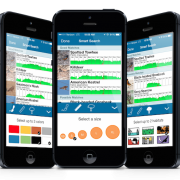 The Smart Search lets you filter the results by colors, size and habitat. You are first asked to pick the colors. Don’t stress too much about selecting the exact colors– the Smart Search algorithm is looks for the closest colors. Let’s search for that little yellow bird. You also saw some black on it so select black too. Did you also see some white? Select white also. Next touch the ruler and select S for small. 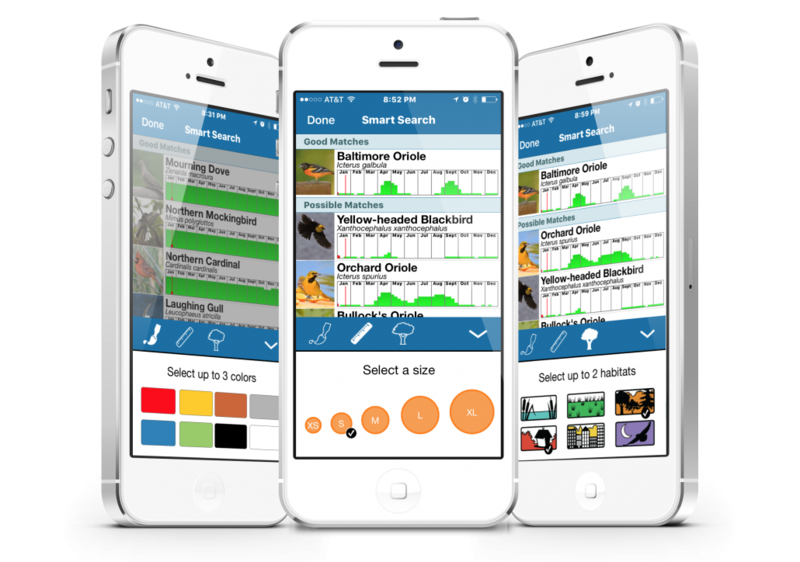 Birds are usually very tied to a habitat and the Smart Search lets you select for that. Touch the tree icon and you can select by up to two habitats. You have 6 habitats to choose from: wetlands (water and cattails), grassland (green grass), woodlands (trees and hills), backyard (shrubs and birdfeeder), urban (buildings), and nocturnal (moon and soaring owl). Imagine you’re at High Island so let’s select a woodland habitat and backyard type habitat. Touch the down arrow to hide the Smart Search filters. Scroll down the list and you should find you just saw your life Magnolia Warbler! Try going up and down in size by one bird. Size is often hard to judge and changing the size a little will often make your bird pop out. Try eliminating one color, especially a minor one. On the filter for the Nearby Birds try selecting the current month instead of Recent Weeks. 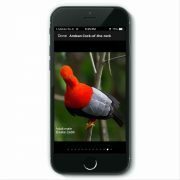 The Recent Weeks uses the bird recently reported to eBird. The Select Months feature uses the eBird data for that month for the last 7 years. Maybe your bird is the first of the season reported and hasn’t been reported yet. The select month will account for that. In less birded areas maybe there isn’t much data for the recent weeks. The select months will account for that too.